So this is strange. I've always noticed a bit of an FPS drop when you go from windowed to fullscreen but never in the neighborhood of 30FPS. Has anyone else noticed this? It's not a huge issue, since it still over 100FPS but I figured I would note it in case there was a regression of some kind on the latest Git builds. -i5-4670K stock, no video card. I tried the build I was using before this one (588) and the problem is there as well. It only happens when I'm running 2x or 3x, it doesn't happen on native. With native I only get about a 10FPS drop when I go fullscreen (on both builds). I wonder how long this has been happening and I didn't notice, since I've been playing FFX on native for a while now to get the most FPS I can out of it. umm, pretty much seems a bug to me !! Are we talking a temporary drop or one that lasts? The drop lasts as long as I stay in fullscreen. When I go back to windowed, it comes back up. Hmm. I don't have that. I just tested FFX. 124 Windowed and 121 fullscreen. Here's my guess: Since you are using integrated GPU, which uses system RAM, going to fullscreen uses more bandwidth and since system RAM is relatively slow compared to VRAM, it drops the FPS. Just a guess. That sounds like a reasonable explanation to me. I'm going to go back and test some older Git builds to see if this has always been the case and I just didn't notice. I'll report back! GSDX does not do EXCLUSIVE FULL SCREEN it does windowed and windowed fullscreen there for FPS should be the same. Do you have any of those enabled? 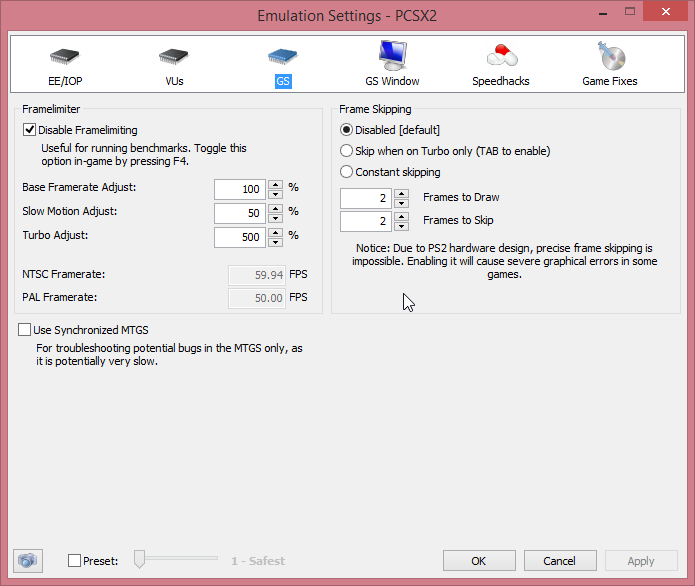 Config=>Emulation Settings=>GS Window=>any of the bottom vsync options enabled? Is there is a difference in the speed in small window(resized) and maximized.